One of the unique features of the Tesla Model S is the option to order different size battery packs. You can order it with with a 60kWh or 85 kWh battery pack, the later offering range close to 500 km (NEDC) per charge. The larger the battery pack, of course, the more expensive the car, but as Tesla is finding out, a lot of its customers are opting for the larger size and greater range, a trend that hasn't gone unnoticed at Nissan, makers of the LEAF all-electric car. During an interview with Plug-In Cars at the recent LA Auto Show, Pierre Loing, vice president of product and advanced planning and strategy at Nissan, hinted that his company may offer a similar multi-pack size option. 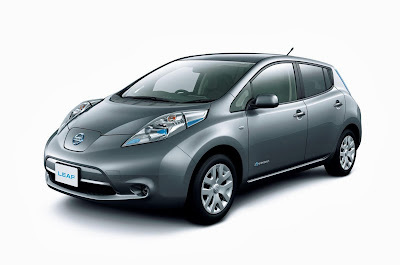 At present the LEAF is rated at 200 km (NEDC) per charge, doubling the size of the pack to nearly 50kWh would push this to 400 km, although the price of the car would increase as well; either the sales price or monthly battery rental cost, if that option were offered. Nissan employees working at the company's Barcelona Technical Centre recently ran a modified Nissan LEAF with a 48 kWh battery in ECOseries motorsport events. In 2009 Nissan announced they were working on a long range lithium-ion battery using a lithium nickel manganese cobalt oxide (LiNiMnCo) cathode. Nissan estimated that the battery would cost about the same as conventional lithium ion ones to produce, as it contains only a small amount of cobalt, a relatively expensive metal. This long range battery, that can store electricity at double the current capacity, wasn't expected to reach production until 2015. Loing did not explain how and when Nissan might offer this option, nor what it might do with pricing, which is currently one of the lowest priced all-EVs available today, especially in the United States, where the company introduced a $6,000 price cut earlier this year and saw sales explode.